Please Note: There's an error in this pattern if you purchased it before 01/19/2017. Click here for the correction. DOWNLOAD FREE PATTERN Adobe® Acrobat® required. Custom fit your socks as you knit them. Knitting socks from the toe up lets you try them on as you go, to make sure they fit all along the way. This instructional pattern teaches you how to knit two socks at the same time on one long circular needle so you have a pair finished at the same time. 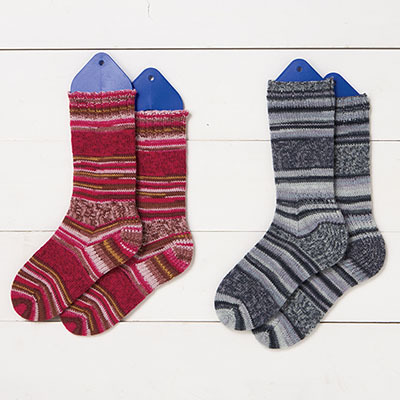 The socks have a traditional heel flap and gusset, and the bottom and back of the heels are worked in a padded slip stitch pattern for additional cushioning. Watch our online video tutorial to learn how to dye your sock blank and follow along with our printed Dye Pattern Technique Tutorial. Read our Sock Blank Dyeing Tutorial or our Gradated dyeing tutorial to get tips on how to create your own sock masterpiece. Kelley talks about Tina's Toe Up Magic Loop sock pattern in podcast episode 66. Oops! There's an error in this pattern if you purchased it before 01/19/2017. Click here for the correction. I love this pattern but I wish there was a separate illustration for how long to knit the foot before doing the heel set up. The hand in the illustration blocks the view of where the foot comes to in relation to the ankle bone. The illustration is more for showing the length of the heel bottom. try utube to get a general understanding. First time and second time I did socks, I took classes at a yarn shop. They are fun once you get the hang of it. Don't give up. I couldn't even get started because the 1st paragraph was so confusing and didn't make any sense. I'll have to try elsewhere! The directions for these socks are some of the clearest directions I have ever read. Nothing is assumed; all the little details that help you check to see if you have done it right are included at the appropriate place in the directions. It is my first pair of toe up socks. Whoever wrote these directions should get a literary prize for knitting directions. Used this pattern to make my very first pair of socks. They turned out very wearable for a first time project. Adjusted a few size issues and have now made 4 pair of socks that I love and wear all the time. Having two socks done simultaneously is the critical feature in this pattern. Thank you for making it available for FREE! What a bonus.